The Kalimati Fruits and Vegetable Market, the largest vegetable market in the country, is currently receiving around 700 tonnes of vegetables per day. Increase in vegetable prices leads to pressure on household budgets in Nepal. However, the good news is that the situation has started normalising and prices are gradually going down. Price of cowpea, which stood at Rs 95 per kg about two weeks ago, declined by 31.5 percent on Wednesday to stand at Rs 65. Red potato, which used to cost Rs55 per kg around two weeks ago, was being sold at Rs 45 per kg on Wednesday. Seasonal agricultural produce such as cabbage and cauliflower also became cheaper by 26.6 percent since two weeks. 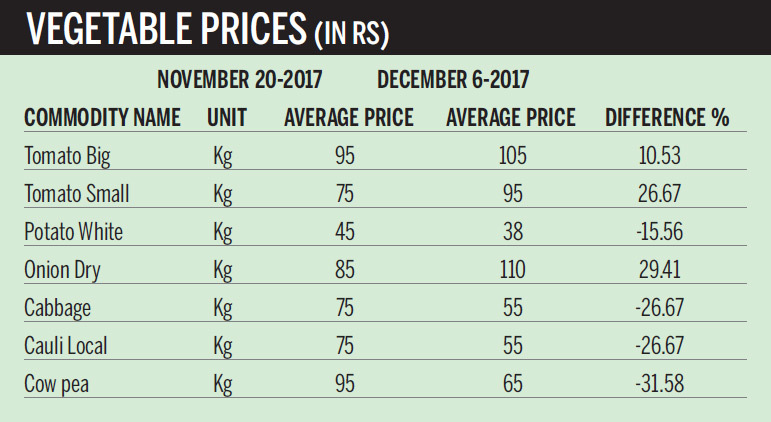 Prices of other vegetables like french bean, bitter gourd, broad mustard leaf, spinach and green onion, have also gone down. “Supply of seasonal vegetables such as cabbage and cauliflower has increased so the prices are declining,” said Binay Shrestha, Deputy Director of Kalimati Fruits and Vegetable Market Development Board. He added that these vegetables are also brought from India. While most of the vegetables observed price drops, other regularly used vegetables, such as onion and tomato have seen a hike in prices. Even with the increased supply, prices of these vegetables been increasing. Narayan Rupakheti, officer at Kalimati Fruits and Vegetable Market Development Board said that the price of tomato has increased as demand for tomatoes has gone up these days. He added that the price of onions has gone up due to price hike in India. Majority of the onions consumed in the Valley are imported from India. Kalimati Vegetable Market is receiving around 8 to 10 trucks of onions per day. Shrestha said that big tomatoes are also brought in from India. The Valley generally gets most of its vegetable supplies from Kavrepalanchowk, Dhading, Makwanpur and Nuwakot. The market also gets its supplies from India as well. “People in the Valley generally gravitate towards vegetables that are priced low which in turn forces prices of other vegetables to drop as most consumers avoid high priced vegetables,” said Shrestha.